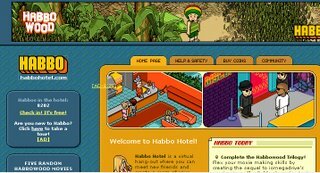 Habbo Hotel is a virtual hotel where you can hang out and make new friends. It's designed for 13 to 18 year olds in the US. When you register you 'become' a Habbo and then you can walk, dance, eat, drink and chat in the cafes, restaurants, swimming pools and games rooms. The real fun begins when you decorate and furnish your own room. Then you can host your own party.